“For all the reasons mentioned in chapter 1, you cannot grow a business without predictable lead generation. 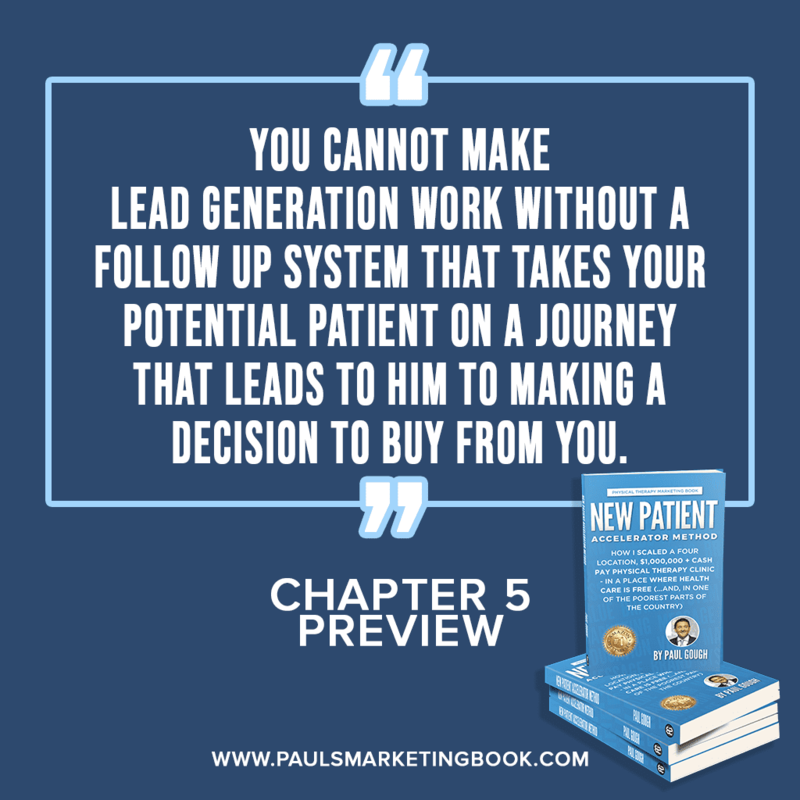 And you cannot make lead generation work without a follow-up system that takes your potential patient on a journey that leads to him to making a decision to buy from you. Lead generation marketing is about attracting qualified leads. It is not about asking people to book now. It is about starting a relationship with someone who has a problem you can solve, and it’s about educating them on how you can help them solve their problem. The follow-up system is about guiding the potential patient along a series of steps so that they become ready to buy. Remember, we are marketing to the people in Group 2, those we identified in chapter 1; those who need what you do, but are just not quite ready to buy from you (yet!). This is the target market with the overwhelming majority, and focusing on this group is the only chance you have of being successful with your marketing. For that reason and more, you need a follow-up system. 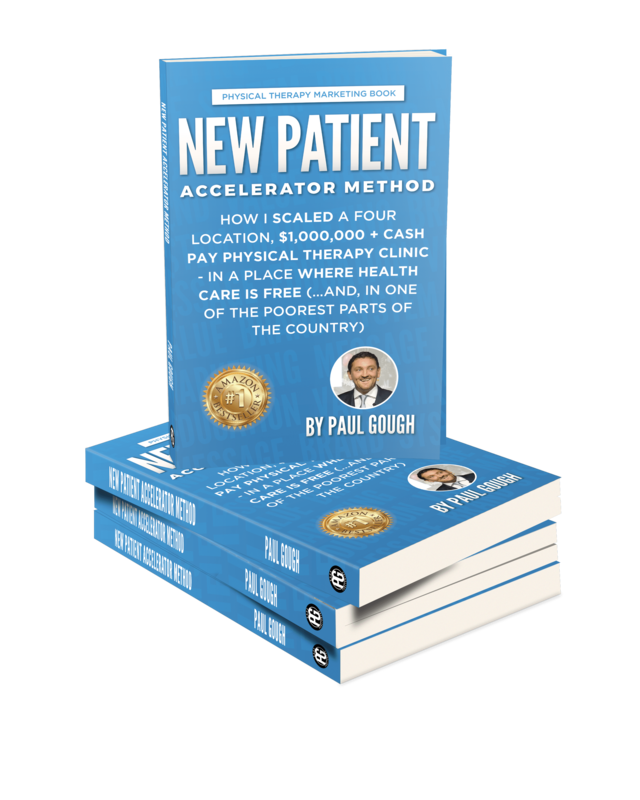 “New Patient Accelerator Method” is OUT NOW! Connect with me on Social Media – and use the hashtag #paulsmarketingbook when you get the book and share your selfie so I can reach out personally to say thank you! “Here’s the worst bit about a lack of early marketing success: the business owner, still scared from the loss and disappointment of the failed marketing campaign, now concludes that “marketing doesn’t work in my town” or that “marketing doesn’t work for physical therapy clinics”. He is convinced that the only way to grow is to do what everyone else does – market to doctors or wait for referrals from past patients. With that way of thinking the business owner is now sentenced to a lifetime of perpetual struggle doing what everyone else does, and getting what everyone else gets – a practice struggling to make a profit. I appreciate that some people are addicted to that struggle – but I assure you, it does not have to be that way. And, if any of that sounds familiar then you are not alone, as this is pretty much the same mistake that I made, and it is how my first two years trying to market my clinic directly to the public looked. Thankfully though I discovered that marketing does work in my town and it does work for physical therapy clinics – I just needed to change what I was doing and how I was doing it. I needed to change the strategy. I needed to accept that I couldn’t help anybody and everybody in pain and I needed to get clear on “who” it was I wanted to talk to (my target market). Once I knew that, it made it much easier to change the message in my ad. “Giving your patients information to give to their friends’ works because it stops your patients from having to become “salespeople” for you. 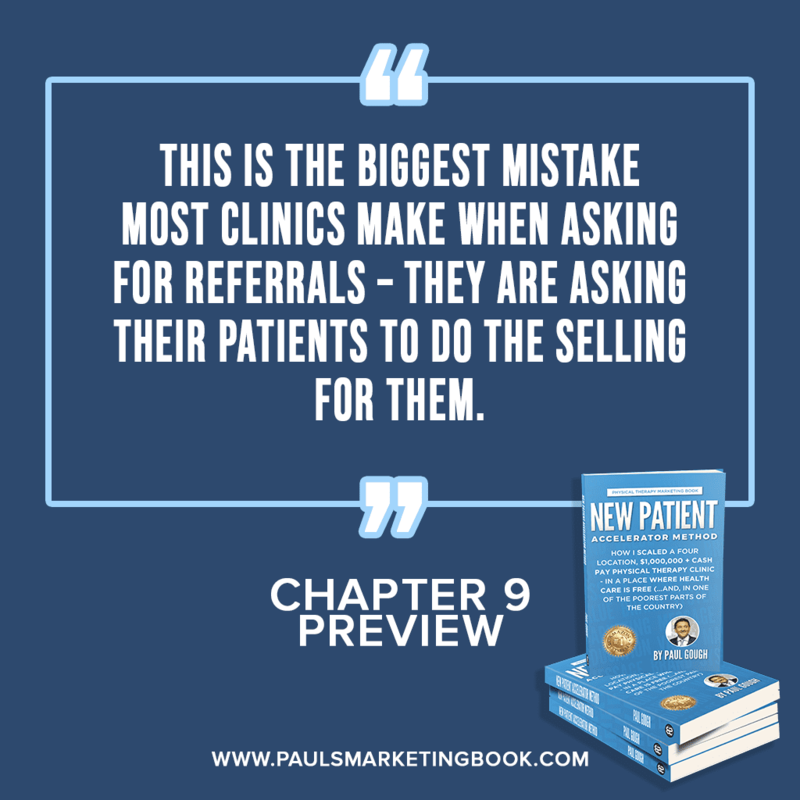 This is the biggest mistake most clinics make when asking for referrals – they are asking their patients to do the selling for them. Chances are patients are telling their friends about you, but they often say the wrong things (they talk about what happens and not the outcome you deliver). Have you ever stopped to consider what people say about what we do? Picture the coffee shop conversation where a past patient is telling someone about you. The inevitable question is “what’s it like”, or “what do they do?”, and if your patient starts to say things like “well, you have to take your clothes off”, “he put his elbow in my back right at the point where it hurt”, or “he stretched my leg into a position it has never been in before”, they’re hardly likely to call, are they? Compound that by how much it costs and they’re very unlikely to call no matter how good your past patient’s intentions are. They are saying the wrong things, which is why so many patients who tell you that they will “tell everyone about you” fail to get them to come and see you. They are simply saying the wrong things. That’s what this system is designed to stop, therefore significantly increasing the likelihood that the potential patient has an accurate understanding of what you really do. If they have a better understanding of what you do they will make better and more confident decisions to hire you. So, the solution to more referrals from past patients is to give them information that they can pass along for you. The best part is, you already have it (from what you are using in your attraction ads). Now you just need to create a system whereby a patient’s friend, colleague, or family member can get it from you. The usual scenario in most clinics is to decide to run an ad out of necessity because the patient volume is looking low, or even worse, the local newspaper called and offered a discount on a spot in the health feature that weekend. Neither is ideal, and the reason why is because there’s zero thought ever going into the strategy about “who” is being targeted, what “offer” will be made to them, or even if the “media” used is where the ideal target market (perfect patient) is going to be looking. 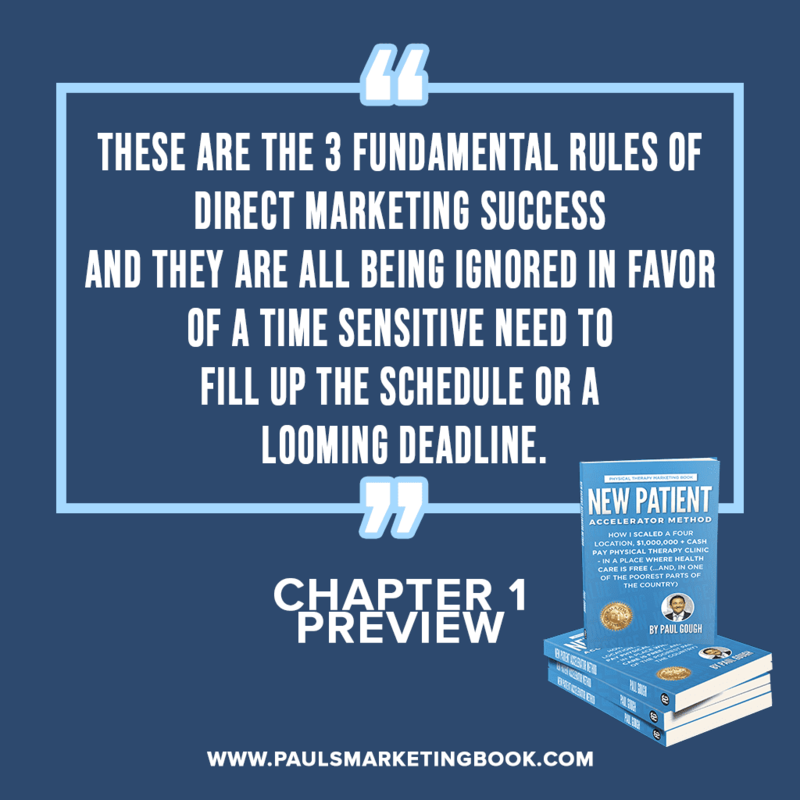 These are the 3 fundamental rules of direct marketing success and they are all being ignored in favor of a time-sensitive need to fill up the schedule or a looming deadline. The only thought is to make the ad look aesthetically appealing and obsess over the color, the position of the logo, the font size and type, and have a designer dress it up with some attractive images. Having spent all that time designing it the ad now “looks” perfect, the clinic owner is certain it represents his or her “brand identity” perfectly, and he can be sure that when everyone sees the ad, the phone is going to ring off the hook. Then what happens next is this: the business owner, still reeling at the loss of the $500 it cost to run the ad, (and the disappointment of being rejected, and heartache of being overlooked), decides that the solution to the marketing issue must be to change the color, change the font, and perhaps make the ad a little bigger, as maybe the reason that no one called was that no one noticed it? So the new, bigger, more visually appealing ad runs. The business owner is even more convinced that they’ve got the “look and feel” of the ad right, and he is beyond certain that this time the phone will ring off the hook. 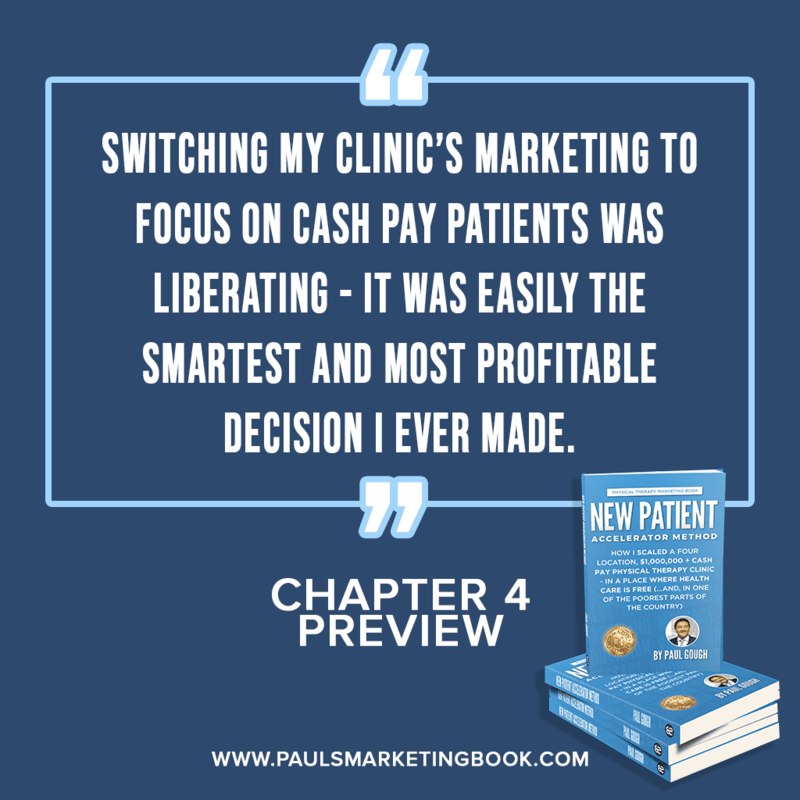 “Switching my clinic’s marketing to focus on cash pay patients was liberating for me – to exit the insurance system was easily the smartest and most profitable decision I ever made. I would recommend it to anyone. However, if you are mostly an insurance-based clinic as you read this, I am NOT suggesting that you immediately end all of the contracts you have with insurance companies. That would be reckless. However, what I am suggesting is that you give at least some thought to the impact that it would have on your business profits if you dropped 20% of the worst payers and replaced $85 reimbursements, (that take weeks to arrive in your bank) with $250 “fee for service” cash pay patients instead who either pay upfront or as they go. I’ve got Accelerator Method students all over the USA who have done exactly that. Let me introduce you to one of them, Kim Gladfelter of Physio-Fit in San Jose, Ca. Kim’s average reimbursement from the insurance companies was something like $85, and her running costs were something like $82 per hour. It was almost impossible for Kim to sustain running a business on margins so thin. Twelve months after implementing the Accelerator system in her practice, she had dropped many of those crappy insurance companies and swapped $85 reimbursements with cash-pay rates closer to $200 per visit. Not only is Kim significantly more profitable, her practice is seeing fewer patients and she also has a much better cash flow. Win-win. Now, here’s a key point: it is important to have both profit and cash flow if you want to grow a sustainable business. I know a lot of insurance-based clinics who are “profitable” on paper but never have any money. They are spending it on expenses faster than they are getting paid, living month to month hoping that the big check will arrive on time, sweating that all claims will get approved. All it takes is one screw up by the billing company you hired and you are in the hole, struggling to pay the wages at the end of the month. All of those problems disappear when you are getting paid at the time of service, or even better when you’re paid up front for a 10-session plan of care. He helps small and independent physical therapy clinic owners in America – from Rochester Hills (MI), all the way across to Orange County (CA) - get more new patients without needing referrals from Doctors using direct to consumer Marketing Strategies. He is a published Author, is the owner of 4 PT clinics, a weekly newspaper columnist and before his stunning success in business was hired by professional soccer teams as head PT. It’s incredible what Paul has accomplished at his own practice... I look forward to every call I have with him… and learning more and more from him about direct Marketing my own cash practice. Paul shows you how to market a successful business in today's economy and has completely changed how I market my (hybrid) clinic. If you want to set up a system to market your practice, I don't think there is a better teacher out there. If you want strategies to help reduce or eliminate your insurance headaches, Paul is the person to show you how – he has concrete ideas to implement rather than strictly theory like so many other PT marketing people. Paul has the Marketing solution to the changes occurring in the marketplace for private practice PTs… he is direct, provides clarity and really opened my eyes on the possibilities for my clinic. Paul’s focus is on the higher, longer term gain for your business, he shows you the systems that are needed to gain new patients and maintain growth throughout the entirety of your business. 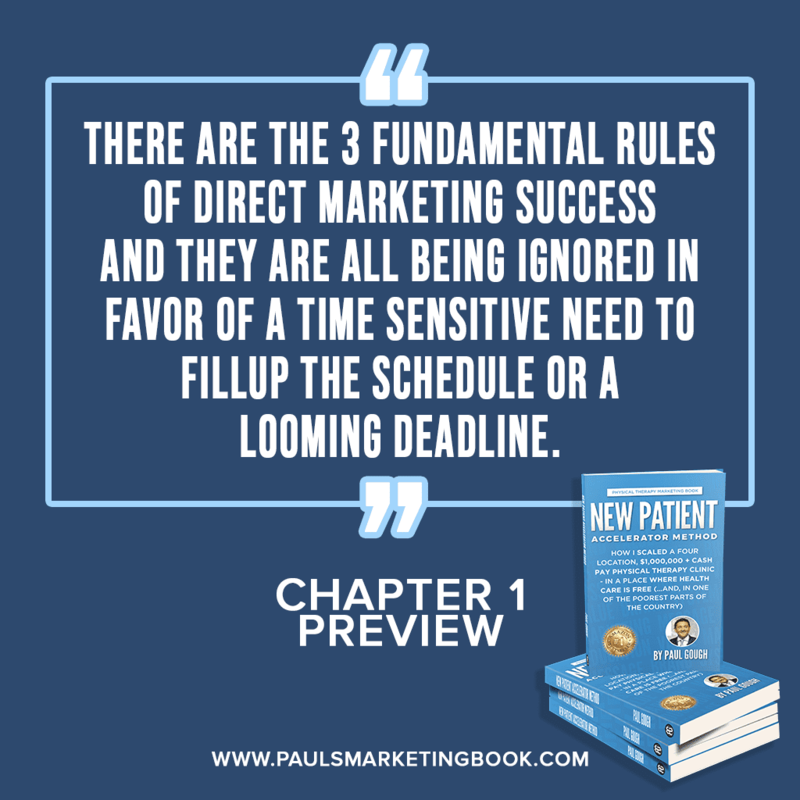 Paul gave me a marketing plan that is fully automated and helping grow my practice without relying on marketing to doctors. Even better, I am now able to attract patients that are in my target market instead of feeling like I have to treat any patient that a doctor refers to my clinic. Paul is highly informative and very inspiring. Paul showed me how to raise my prices by implementing a real price strategy at my practice…I went from charging $95 to $180 almost overnight - with zero resistance - just by implementing what he told me to do. I’m excited to be working with him and watching my clinic grow! Paul is doing amazing, cutting-edge things in the field of PT marketing – I have no doubt he’ll soon have more owners wanting to work with him than he can handle…if you want to grow your PT practice, you have to connect with him fast! Almost immediately after hiring Paul he helped me generate more revenue in my business by changing our internal sales systems and improving the way my team connect with patients. I look forward to every call I have with him. To be able to compete against FREE is amazing… the marketing tips, techniques and mindset offered by Paul are absolute gold! After a short meeting with Paul, he opened my eyes to the possibilities of what automation and direct response marketing can do to my business - and I am excited to now be taking my PT clinic to stratospheric levels under his tutelage. In just a few short weeks Paul put a marketing system in place at my clinic that is now helping me move away from relying on doctor referrals and seeing 30 patients per week, to my goal of 100 - he will give you good idea, after idea, after idea! Paul is refreshingly honest, straight-forward and easy to talk to and I love his no-nonsense approach to direct marketing. You’ll find with Paul that he is up front about what to expect, and more importantly, he is honest enough to tell you what NOT to expect, as far as a massive influx of new patients happening by tomorrow. I’ve recommend him to other PT owners who have been equally impressed with their results. "Please confirm your details here now and Paul will instantly send you a copy of his currently Free Special Report to help you build a more Profitable Clinic”. "Just confirm your details below and Paul will know to send you regular marketing tips as well”. "Just confirm your details below to get your free PDF on ways to get UNLIMITED REFERRALS from Direct Access”. "Just confirm your details below to get your free PDF on ways to catch more new patients from your pt clinic website”. "Just confirm your details below to get your free PDF on marketing ideas to get new patients”. "Just enter your details and we’ll instantly send you more information about the Next Level Coaching Program helping PT's across the USA to grow more successful clinics”.